Bring home the action with these super fun and exciting Dr.Dunk basketball hoop products, an exclusive offering only from Mytopia. A perfect addition to any garage or backyard, use them to improve your shooting or play nonstop hoop action with your family and friends. 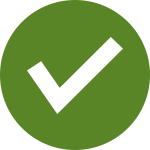 Turn any space into something special and in your next game, surprise everyone with your A game without having to go to the gym just to shoot around and practice. Available in Pro Mini Hoop and Pro-Series versions, these Dr.Dunk basketball hoop systems are made of high quality and durable materials. Combining elegance and functionality, the backboard is made from shatterproof polycarbonate. The sturdy full-size ring can easily handle alley-hoops and dunks, while the massive capacity heavy-duty base can be filled with sand or water to provide a stable foundation. 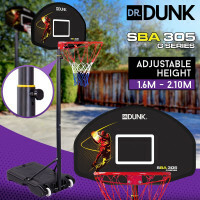 Thanks to the heavy-duty adjustable steel frame mechanism, Dr.Dunk basketball hoop systems can be tailored to your desired height. 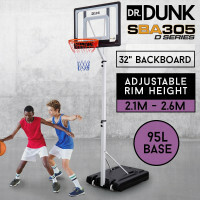 Ideal for all ages, you can set it up to a regulation height of 3.05m and play just like your favourite professional basketball player. Likewise, you can also set it up to a much lower height of at least 2.3m and allow your kids to experience some slam dunk action. 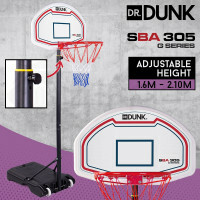 To move around easily, the Dr.Dunk basketball hoop system comes with roller wheels for easy manoeuvrability. Position it anywhere from your backyard to even at the end of your street. For added fun, each system comes with UV-resistant backboard graphics. Other things to love about these basketball hoops include their mega-tough construction, super thick padding to protect you during serious one-on-one sessions and the ingenious tripod design for added stability. 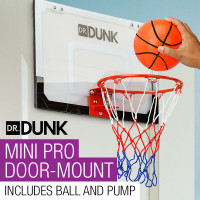 Complement your Dr.Dunk basketball hoop system with the other fantastic toy products from Mytopia. Choose from our wide variety of Ride-on Toys which include Balance Bikes, Ride-On Bikes and Ride-On Cars. We also have an assortment of Sandpits, Doll Houses, Scooters, Toy Kitchens and Baby Playpens to keep your kids truly happy. Enjoy countless hours of fun-filled and action-packed hoops action. 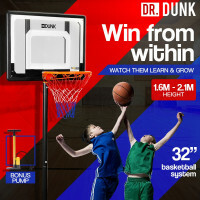 Order a Dr.Dunk Adjustable Basketball System today!